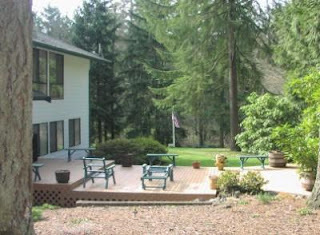 When we moved into our house 3.5 years ago it came with a long somewhat narrow freshly painted deck off of the back of the house. We loved our deck and had many meals on it, hosted parties that gathered on it and even put wadding pools on it in the summer for the kids. But after a couple of years we noticed that the paint was peeling and in some spots the boards were starting to get soft. This past summer this got really bad, and before any gathering I had to go jump on the deck to see if any of the boards were rotten. On a couple of occasions I even put my foot through the deck. Then Hubby would have to go scrounge some scrap 2x4s to patch the hole. It was time to replace the deck! 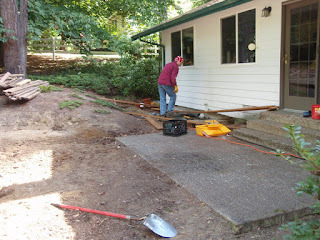 So I called a few companies for quotes on expanding and fixing our beloved deck. 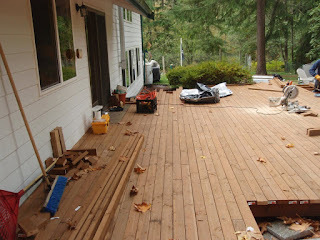 Some quotes were fairly high and didn't really give me exactly what I wanted, and most of them didn't include replacing the underlying structure of the existing deck, just re-decking the surface boards. Other companies didn't even get back to me with a quote at all...I guess if you're not putting in a huge composite deck they don't really want your business. So after much thought, Hubby decided to just replace the deck himself. He ordered the lumber online, had it delivered and even got the contractor rate because the order was so large. Then the tear out started. He wasn't sure what he'd find when he tore off the top boards and thought that the structure might be in good shape, but that's not what he found. Basically, the deck seemed to be built out of lumber that really wasn't supposed to be used outside, and then got painted to "seal" it for outdoor use. The top boards as well as all of the underlying structure was rotten and just waiting to collapse. So it all got torn out and thrown on the scrap pile. Now we're a few weeks into the re-build of the deck and it's looking really nice! The structure probably took the most time to build, and now the decking boards are going on really quickly. Stairs will come next and after that we'll think about railings on a couple of high places. But I'm really pleased with it. 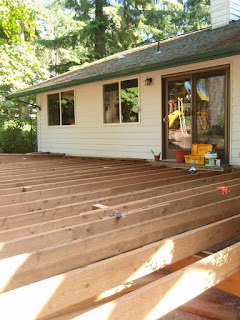 We almost doubled the width of the deck in the middle and added on a long section next to the house. The funny shaped section at the end under the trees will most likely not be re-built. I'm thinking of putting a paved patio there or using it as a garden space...or something I haven't thought of yet. And by having hubby do it himself I think we probably saved about $5k in labor costs. Yay!